The simulator consists of two sections: simulator window and variables menu. 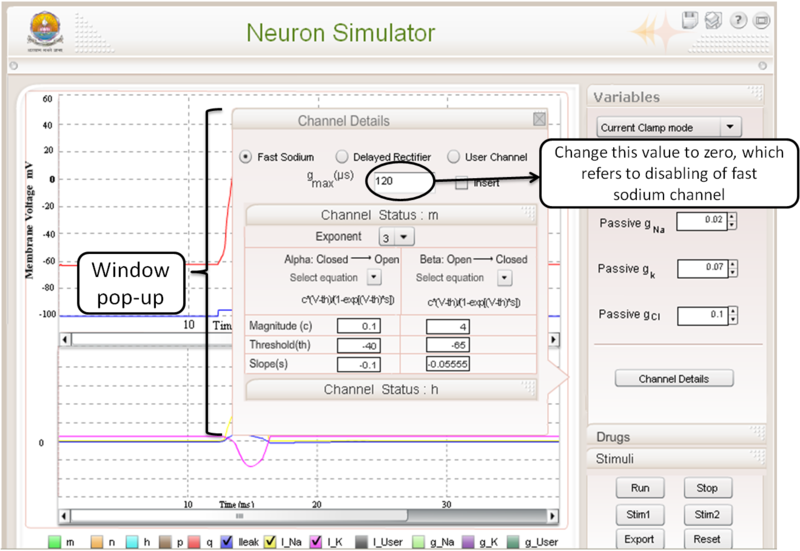 The simulator window shows the membrane potential vs. time plots and the gating variables plots. This window is divided into two subplots. 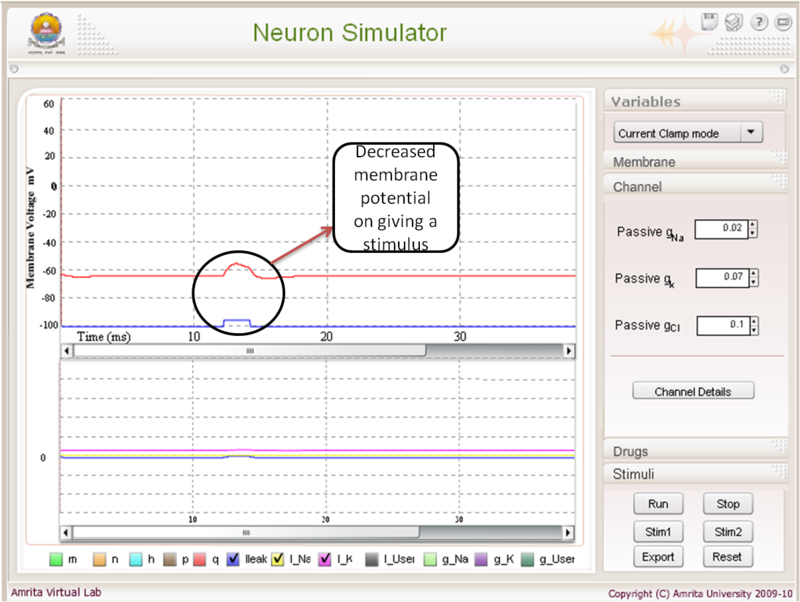 The upper subplot shows the membrane potential vs. time plot and the lower window shows the plots of the gating variables. 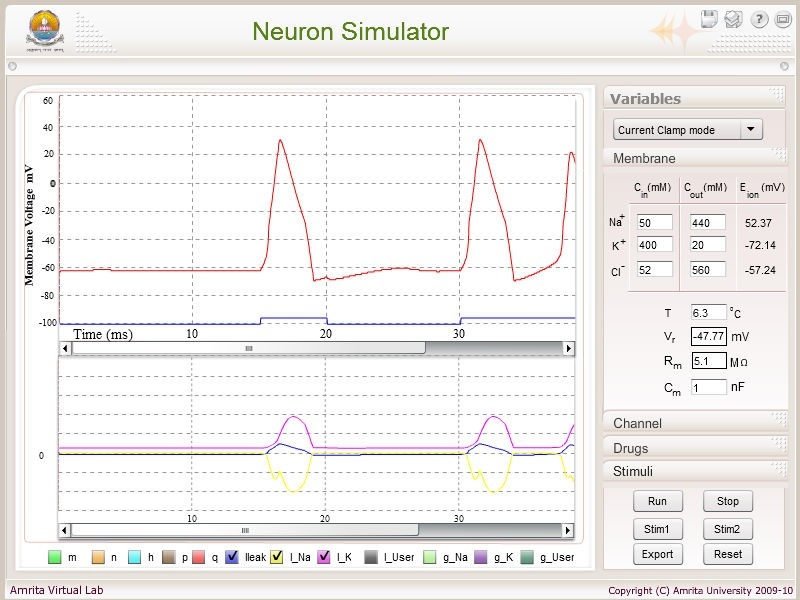 The user has the ability to choose any 3 gating parameters provided at the bottom of the simulator window to visualize their dynamics. In this exercise, we study the dynamics of delayed rectifier potassium current. 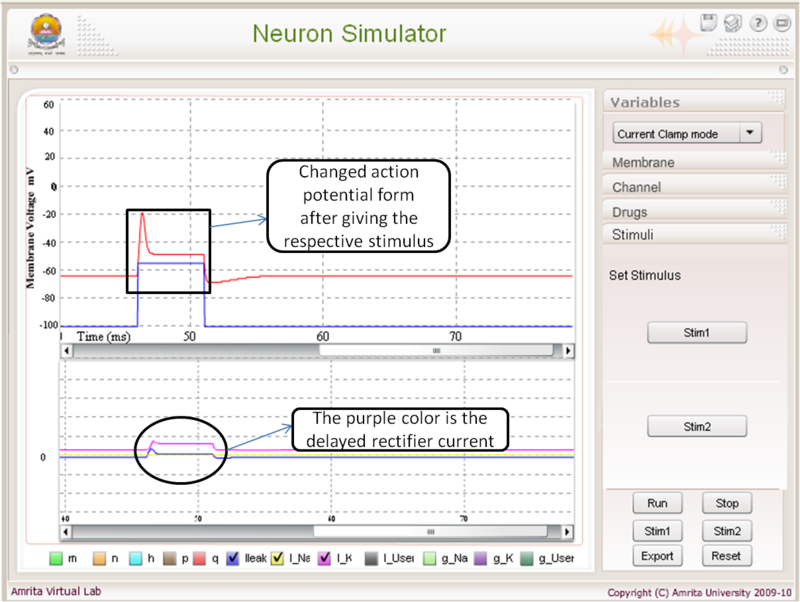 Click on either Stim1 or Stim2 and let the action potential get plotted. Open the channel window, wherein you can see a button labeled "Channel Details" (observe the screenshot below). On clicking the "Channel Details" button, you can see a small window pop-up, wherein different parameters can be seen. Various options include fast sodium channel, delayed rectifier channel and user defined channel. The user need to disable the fast sodium current by changing the maximal conductanct (gmax) to zero. After you disabled fast sodium channel, click on Stim1 button and you can observed that the depolarization decreases to very low level. The below screenshot gives you a glimpse of that. Now set the Stim1 parameters with 100 nA current amplitude lasting for 5 msec and rerun the simulator with Stim1 as input. Observe the plot of delayed rectifier current on the lower sub-plot window. Likewise the dynamics of delayed rectifier current can be studied by following the above procedure.